Pigmented lesions, for which patients routinely present to dermatologists, are difficult to define and are often synonymous with melanocytic proliferation. Because treatment of these benign lesions is usually sought for enhancement of cosmetic appearance, selectively targeting the pigment would be the ideal treatment modality for their management. 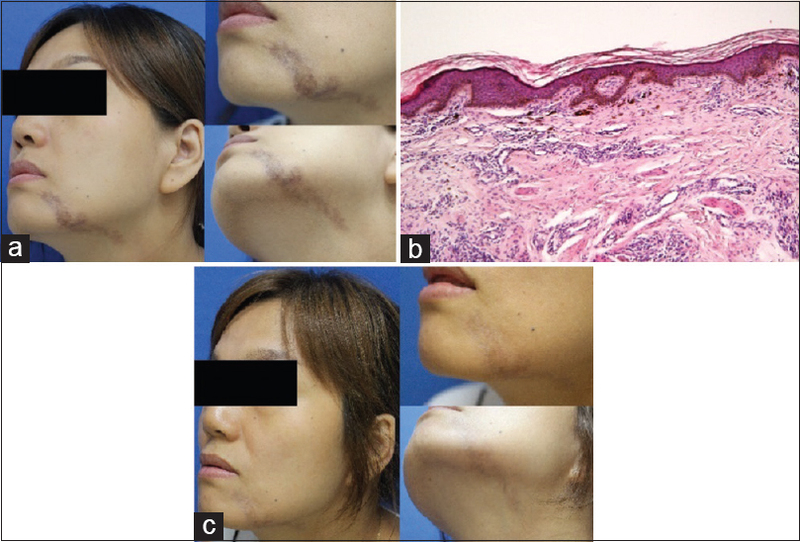 A 37-year-old woman presented with linear hyperpigmentation on the left side of her chin that appeared a year before presentation. The lesion gradually darkened and progressed downward during the gestational period. Physical examination revealed a linear brownish-colored patch on her perioral area with a downward and laterally curved orientation [Figure 1]a. She reported no history of skin diseases. Microscopic examination revealed basal layer hyperpigmentation, and focally increased epidermal melanocytes and dermal melanophages [Figure 1]b. Based on the clinicopathological correlation, we diagnosed her as having lentigo. Patterns of embryological pigmentation on the face have recently been proposed. The shape and distribution of lines closely resemble Blaschko's lines on the face. The patterned pigmented lesion is acquired, nonnevoid, idiopathic facial pigmentation distributed specific locations such as periorbital area, zygomatic area, malar area, the root of the nose, perioral area, and mandibular area. Preferential locations of acquired patterned pigmentation on the face are periorbital, central, perioral, and periaural segments. Perioral lesions begin to develop around the oral opening and progress laterally and downward. Incidence of acquired patterned pigmentation is slightly higher than that of segmental lentigines. At present, there is insufficient evidence to demonstrate a correlation between pregnancy and darkening of nevi and molecular pathways explaining this mechanism are unclear. Pregnancy-induced alteration in the hormonal milieu, stimulating melanin production in melanocytes is considered a probable pathomechanism. The lesion was cosmetically objectionable to our patient, and she did not want to be affected her daily life. She was treated using low fluence 1064-nm Q-switched neodymium-doped yttrium aluminum garnet (Nd:YAG) laser (Spectra, LUTRONIC Corporation, Goyang, South Korea) over 20 sessions at 1-week intervals. Her dermatologist performed laser treatment using collimated, 1064-nm wavelength, 5-ns pulse width, 7-mm spot size, the fluence of 1.5–2.0 J/cm2 at 1500–2000 shots per treatment. The pigmented lesion was significantly reduced without complications following 20 treatment sessions [Figure 1]c. After 1 year of follow-up, the patient maintained improved state without repigmentation. To avoid pigmentary or textural alteration, patient with darker skin should be treated cautiously with low energy, irradiated until mild general erythema occurred, and cooling technique with ice pack or ice cube. Before the availability of lasers, invasive methods such as surgical excision, cryosurgery, and chemical peeling were primary treatment options, which were associated with adverse effects such as scarring, permanent dyspigmentation, skin atrophy, and recurrence. An advantage of low-fluence 1064-nm Q-switched Nd:YAG laser therapy that has emerged since the mid-2000s is its requirement for minimal downtime and a low incidence of associated complications. Although several reports have described patterned pigmented lesions on the face, no reported treatment strategies have been established. We propose that low-fluence 1064-nm Q-switched Nd:YAG laser treatment is a promising therapy for patients showing Fitzpatrick skin type three and four because it minimizes postinflammatory hyperpigmentation. Large clinical trials are needed to confirm the effectiveness of this treatment. Written consent from patient was obtained for this article. Happle R. What is a nevus? A proposed definition of a common medical term. Dermatology 1995;191:1-5. Sarma N. Pigmentary nevi on face have unique patterns and implications: The concept of Blaschko's lines for pigmentary nevi. Indian J Dermatol Venereol Leprol 2012;57:30. Bieber AK, Martires KJ, Stein JA, Grant-Kels JM, Driscoll MS, Pomeranz MK, et al. Pigmentation and pregnancy: Knowing what is normal. Obstet Gynecol 2017;129:168-73. Kim JY, Choi M, Nam CH, Kim JS, Kim MH, Park BC, et al. Treatment of melasma with the photoacoustic twin pulse mode of low-fluence 1,064 nm Q-switched Nd:YAG laser. Ann Dermatol 2016;28:290-6.